Would you believe we have things moving along with the website? It’s true. If you don’t believe us, how are you not noticing the format change we’ve enacted? You’re not having this read to you by a robot are you? Damn you Cortana and Siri, stop stealing jobs from healthy eyeballs! We do not submit to your gentle tyranny of soft spoken control! 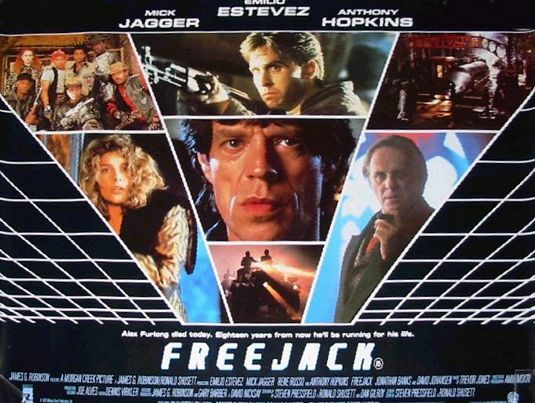 Today we discuss a rather special film, Freejack(1992). It’s special because Tim promised it was good and almost a classic. It features a mostly notable cast including the brother of Charlie Sheen, Emilio Estevez(whom, although not as famous as his brother, Charlie would probably rather be as it would mean not having Two and a Half Men be the highlight of his career). It takes place in the far off future of two thousand nine where rich people steal people from the past, who are about to die, for new bodies. Which is not the same plot to Millenium, which Tim also picked. We’re starting to think Tim’s first order of business, should he find a Count of Monte Cristo fortune, will be to invest in time travel and body swapping medical research. Weltall then talks about a Youtube channel, Engineer Guy. It is, as you might take from the name, a channel done by an engineer. He discusses a lot of varying bits of tech from an engineer’s standpoint from Nerf Guns to the Titanic. Weltall’s favorite though is the re-told Faraday lectures with notation for clarity. It’s a very interesting series explaining, the then, modern science using a candle as the base. Tim then also discusses a Youtube channel because sick minds often think in parallels. We’re pretty sure that’s how riotous mobs form. His channel is The Great War which is a weekly series recapping the week, one century ago, the events of World War I. If your understanding of that war begins with the Arch Duke Franz Ferdinand, is filled with trenches and mustard gas, then ends with the Treaty of Versailles, this channel will fill you in on details you never got from your history teacher.